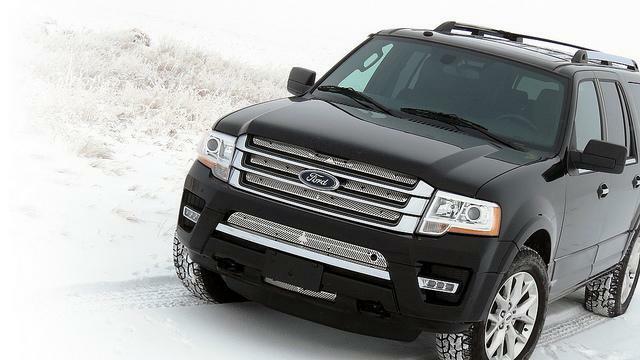 Buyers in the market for a three-row SUV should put the 2016 Ford Expedition at the top of the "Must Have" list. Both the standard Ford Expedition and extended-length Expedition MAX deliver all of the power, capability and space that simply can't be matched by car-based crossovers. The MAX models, especially, should be considered if roomy goodness is a priority. There's over 1200 litres of cargo room behind the third row. That's best-in-class. This nearly triples when both the second and third row seats are folded flat. Such spaciousness not only makes it easy to carry large and/or bulky items and cargo, but allows tall passengers to stretch their limbs with ease no matter where they're sitting. The Expedition gets the latest version of Ford's Sync infotainment system for the 2016 model year. This version of SYNC brings new software such as the Siri Eyes Free feature to the easy-to-read 20 cm colour touchscreen. Users will find access to their favorite apps and features simpler and faster than ever. Finally, the automated updates over Wi-Fi process makes sure SYNC 3 is always current with the latest software. Continuing to power the Expedition is last year's 3.5-liter turbo-charged V-6. Part of Ford's famed EcoBoost line of powerful and fuel-efficient powerplants, this particular one churns out 365 horsepower and 420 pound-feet of torque. It's paired to a six-speed automatic transmission. Four-wheel drive is standard. The regularly-sized models have a fuel consumption figure of 16.2 L/100km in city driving and 11.9 L/100km when cruising along the highway. MAX models consume slightly more: 16.4 L/100km city and 12.0 L/100km. As always, these fuel consumption ratings are based on Government of Canada approved test methods. Actual fuel consumption with the Expedition will vary for all ratings. The Expedition has a tow capacity up to 4173 kg when properly equipped. Buyers have a choice of XLT, Limited, Limited MAX, Platinum and Platinum MAX trim levels. All come with the above power- and drivetrain, an engine block heater, a full-size wheel and spare tire, hill descent control, hill start assist, power windows and door locks, a rear view camera and trailer sway control just to name a few. As one climbs up the trim tiers, the number of both standard features and options rises considerably. The XLT comes with power-adjustable pedals and a base version of SYNC. Both Limited models add push-button ignition, heated and power front seats, heated second row seats, navigation and SYNC 3. All these, unsurprisingly, come standard in the top-ranging Platinum and Platinum MAX. Items to these trim levels include leather upholstery, larger wheels, a blind-spot detection system with cross-traffic alerts, and exclusive badging. Visit our dealership to learn more about the 2016 Ford Expedition. Contact Us to test drive a Ford Expedition Today!